Pete expands on the 7 primary lessons (or gifts) from the Rule of Benedict that have profoundly influenced his life and leadership. The pressure to present an image of ourselves as strong and spiritually “together” hovers over most of us. We forget that not one of us is perfect and that we are all sinners. Pete explores Psalm 51 as a model for us, concluding with a few thoughts about our need to climb a ladder of humility if we are to lead well. Leadership in the name of Jesus is from the bottom up, not a grasping or controlling of circumstances and people. It is leading out of failure and pain, questions and struggles — a serving that lets go. It is a noticeably different way of life from what is commonly modeled in the world and, unfortunately, in many churches. Listen to this podcast about God’s strange pathway of living and leading out of brokenness and vulnerability. In the gospel of John the word "belief" can best be understood as "relax in" or "trust." How do we get there? Listen to Pete’s message based on John 6:16-21 and learn to relax. Being a leader is knowing what to do next, why it’s important, and then bringing the right resources to bear that will make it happen. And yet a core part of discipleship is being able to say, "I don't understand, Lord." Pete shares why it’s necessary for each of us to go through “Dark Nights of the Soul” where we don’t know what’s going, because these are moments where God pulls us into deeper discipleship with Him. Pete shares how the truths of 1 Corinthians 13 and learning to really love others impacted him personally, radically changing his leadership and the discipleship culture at the church. Taken from a message given at the 2017 Emotionally Healthy Leadership Conference, Pete looks at three aspects that make John the Baptist an unlikely but extraordinary model of leadership. It is easy to lead for God without listening to him. The word listen or hear is found more than 1500 times in the Bible. That is why the most important question every one of us must ask throughout our days is: “God, how are you coming to me, what might you want to say?” In this podcast, Pete gives specific examples of how he regularly applies this question to different areas of his life and discernment process. Pete discusses a number of powerful truths around Jesus’ command: Love your enemies and pray for those who persecute you... If you love those who love you, what reward will you get? (Matt. 5:43-45). 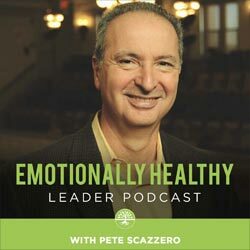 Pete introduces the ladder of integrity, a simple yet powerful tool to be used when we are feeling angry, frustrated, or hurt in a relationship or a situation.